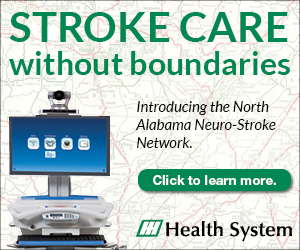 Huntsville Hospital is the only Primary Stroke Center in Madison County. The most recent guidelines from the American Heart Association/American Stroke Association recommend that paramedics transport a stroke patient to the closest facility most capable of treating acute stroke, even if that means bypassing other hospitals. Our physicians and specially-trained staff in the neurological patient care units and Neuro Intensive Care Unit (NICU) want the best possible outcome for each patient. Stroke is the third leading cause of death in the U.S. Huntsville Hospital’s 24/7 Stroke Team reminds you to seek medical help immediately if you or a loved one experience any warning signs of stroke. Know the symptoms and act F.A.S.T. Time – Call 9-1-1 immediately. Approximately 1.9 million brain cells die every minute a stroke goes untreated.